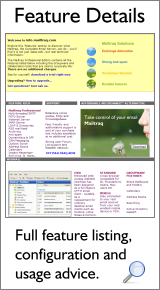 Webmail for your desktop and for mobile devices - browse your webmail directly using a special lightweight client. Full function high volume Mailing List (CRM Messaging) engine. Store and reuse 'stock-phrases' in webmail - perfect for Customer Service and Sales. Control 'what is said' - increase productivity. Allow users to - enable, disable, change Out-of-Office autoresponders. Set time date and repeating. Microsoft's Live.com and Google's Personalized search page. Full private NNTP (news/group) server. Private Instant Messenger. Secure, recorded - perfect for closed environments, such as Financial, Legal and Medical Services. Control and Alert when banned words or phrases are used in emails - protect against law-suits and avoid unauthorized diclosures.